OUR first whole day in Tarifa was spent reuniting with the swimmers we met 3 years ago in Sardinia. Brothers Chris ( London) and Ben ( USA) , Dan from the USA, Yves from Swimtrek and Chris G from London. It’s also great to be with Lisa and John Donati, Jordan’s parents and Cameron Rob’s friend from Brisbane. We met and there was a lot of discussion about logistics of the swim. Which swimmers would make up the two teams. We thought it was settled, but the next morning it changed again and finally the teams are Yellow- Chris and Ben, Yves and Dan. Red team Steve and Rob, Cameron and Chris G. It’s hard because they are different speeds but for the swim they must stay together. 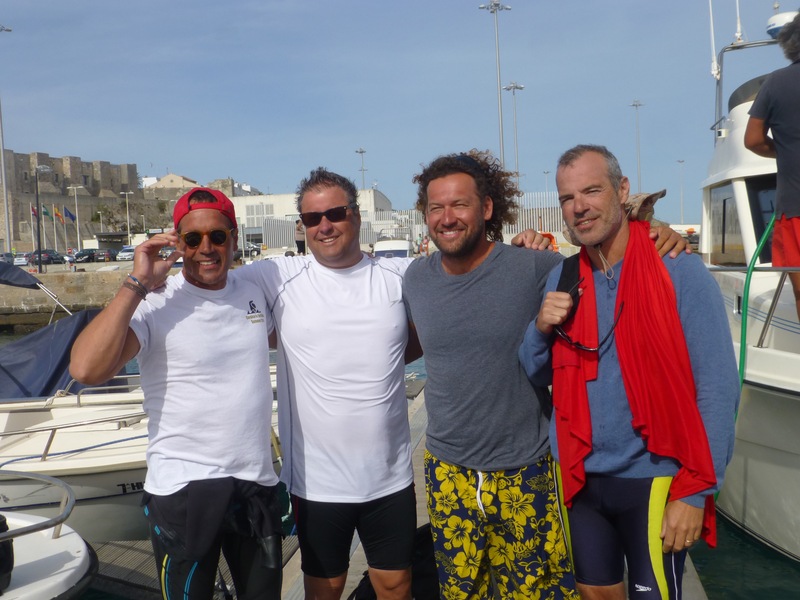 Steve and Rob will probably be the only father and son to do the Gibralter swim which is pretty special. They had a meeting with Rafael who is the main organiser of the swim. He is very particular which I guess you have to be when it’s such a difficult swim. It all depends on the currents and the pilot of the boat will give them instructions on when to push harder and use the current. There are 3 possible landing points in Morocco. If the currents sweep them too fast and they miss the first then they add a km or two to their journey. Oh boy. It’s sounds so hard and there are a few nerves around and that’s just from the supporters. We keep looking across at Morocco and asking WHY! The day finally came for the yellow team and we all went to the port to see them off. I even became “Miss Vasolina” and got to rub the vasoline in to prevent chaffing. Quite a job on all those muscles! The Yellow team. Yves, Ben, Dan and Chris. The day then became a waiting game and using ship tracking watching where they were. We started waiting – at a very nice cafe by the beach. Everything was white. Really restful and beautiful. 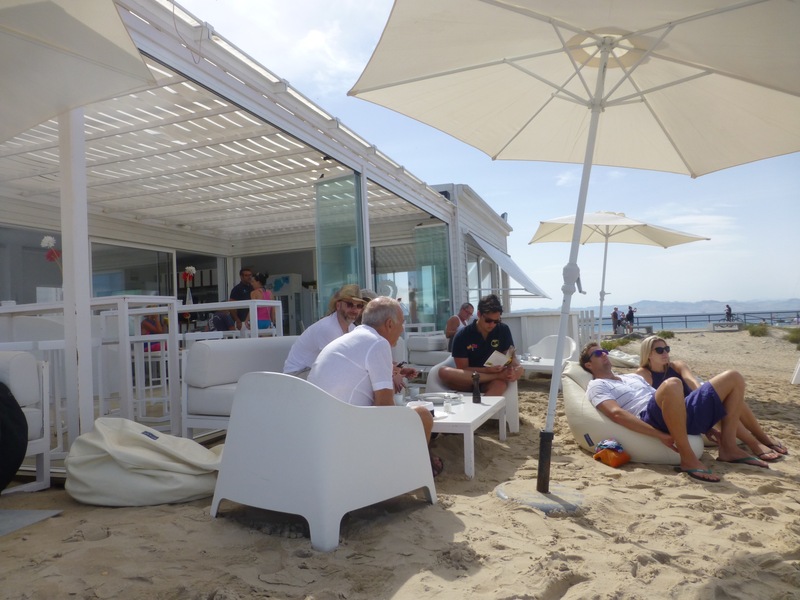 The white beach cafe. Very pleasant. 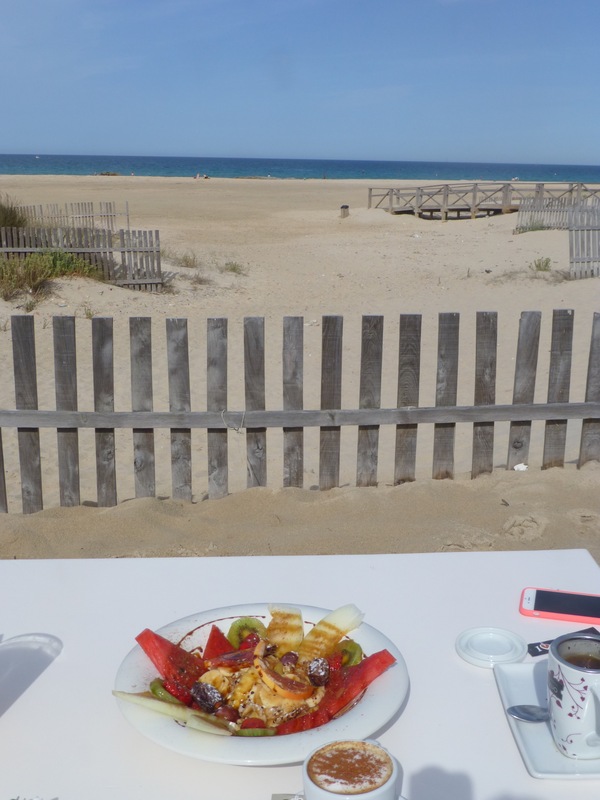 Check out the breakfast with a view. Not bad at all. So we went to the wharf and waited and waited and at nearly 6pm they arrived back. Smiling. Also a huge effort by John Donati who went on the rubber duck as the support person and did the feedings and water bottles – a job I’ll be doing tomorrow. Jordan will also come along and take photos. The jubilant yellow team. Do they look any different? They were tired and happy it was over but brimming with stories of fish – tuna and huge fish they thought were sharks but weren’t. So tonight a celebration for them and a waiting game for our team. Wish Steve and Rob, Cameron and Chris good luck and let’s hope they aren’t in the water for 5 and a half hours. Rob is figuring on about 4 to 4 1/2. Fingers crossed. Chris M from today’s swim wishes Chris G on tomorrow’s swim the best of luck. Wow Fran. The time has finally come for Steve and Rob! Probably harder to go second. Can’t wait to hear they’ve made it and can enjoy the celebrations like the yellow team. Good luck Maitlands! Oh Fran! I’m exhausted just reading about it!!!!! Loved the white cafe. Never knew vaseline rubbing was one of your special talents – you’re full of surprises. I’m nervous just reading about it. Good luck to all the boys. Can’t wait to hear. Tariff looks as lovely as I remember. Good luck boys, I can’t stop thinking about you. For someone who can barely do a length of the pool, a 51/2 hour swim is almost unimaginable. I am on tenterhooks – please post the next instalment soon…………. Good luck boys! And your wonderful supporting girls – looking forward to some great photos !